Meguiar's® D106 Pro Fiber Rinse & Tannin Stain Remover is specially formulated to quickly remove tannin stains and pH neutralizes carpet and seats after using Meguiar’s® All Purpose Cleaners. 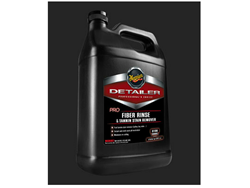 D106 Pro Fiber Rinse & Tannin Stain Remover, will minimize re-soiling of fibers too!! !